Pregnancy is different for everyone. 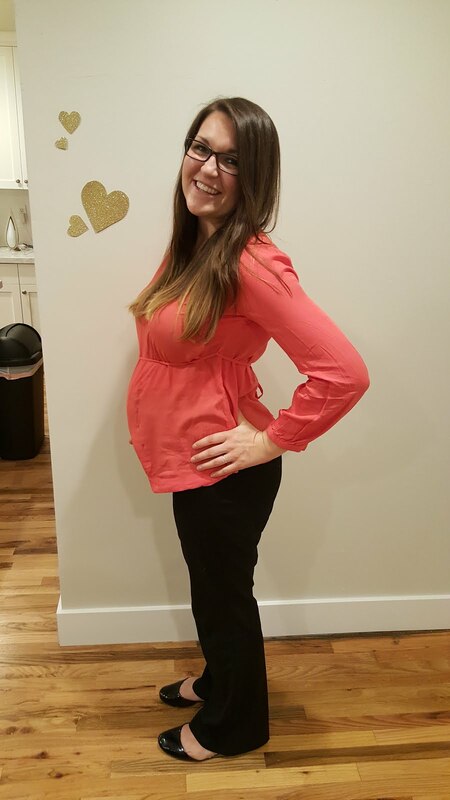 I have to say, for the most part, I have loved pregnancy! I think I love it so much because I am constantly amazed by what our bodies can do. Growing a baby is truly such a miracle. I am so proud to be a woman. 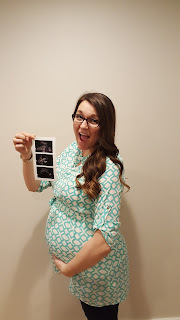 Since I'm just getting around to blogging about our announcement/gender reveal, I'm going to share updates from throughout my pregnancy so far and then I plan to post updates every 2-4 weeks or so. First trimester: Challenging. With Rheumatoid Arthritis, I was off all medication and I started to flare quite a bit, all throughout the month of November. That combined with the afternoon nausea (started at 2-3pm everyday without fail) was no fun but honestly, it passed quickly. Based on what I had heard, I thought it would be worse but by the time we found out and then the nausea started, it was really only a month/month and a half before second trimester. I have not thrown up at all during this pregnancy so I consider that one of the best blessings. I was a little lax with my typical healthy eating because bread and cheese were all that sounded okay to ward off the nausea. I ate a few too many nachos, quesadillas, and grilled cheese. I was so tired the first trimester throughout the work week, I would come home and each day go to bed 30-60 minutes earlier than the night before; by Thursday night some weeks, I was going to bed at 6:30pm - no joke! I also had this weird dry mouth - I even attempted to make my own "moisturizing toothpaste" and it didn't help. 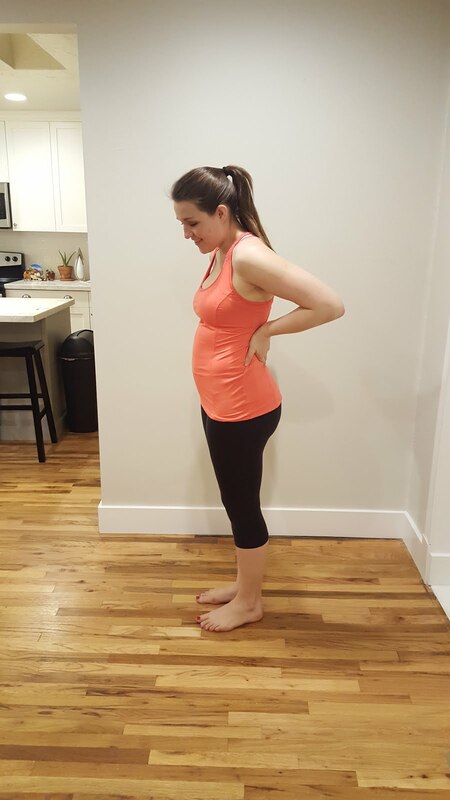 14 and 15 weeks - I really thought I had a bump then...not quite! On the way to the gym...somehow this is when we already remembered to take photos (haha). Second trimester: Exactly as everyone tells you - as soon as I hit second trimester, instant relief and enjoyment! As I look back on my second trimester, I would do it all over again. 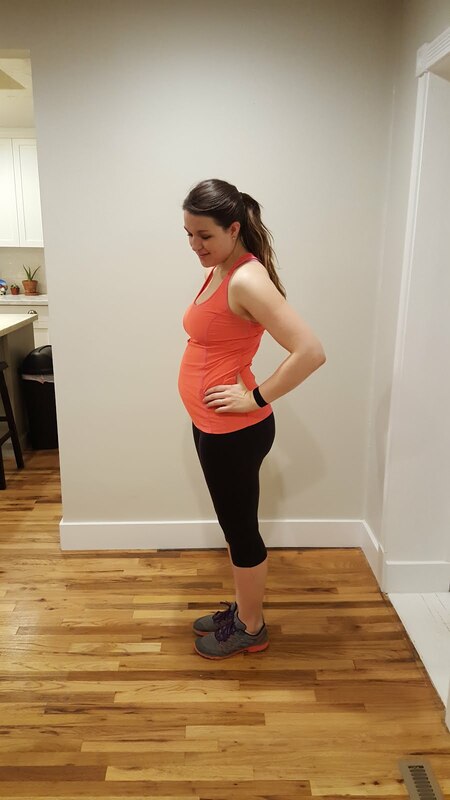 I started to exercise again (because I finally had the energy) and hardly felt/looked pregnant until I reached closer to 20 weeks. A few times I asked myself, "Am I really pregnant?" 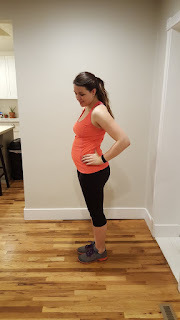 I'm finally starting to feel pregnant in the last few weeks of my second tri. Feeling baby move in my stomach at 19 weeks, it felt like little butterflies or fish in my tummy. Baby moves more and more every day now! Even better, Braden feeling baby boy move for the first time just before 20 weeks - we were sitting on the couch at home on a Friday night and he put his hand on my tummy and baby pulled out his ninja skills. The movement was light but obvious and Braden's eyes lit right up! "Was that baby?" Now Braden puts his hand on my belly and talks to baby every night before bed. When baby moves in my tummy, Braden says "it is like whack-a-mole!" Don't worry, we don't "whack" too hard! 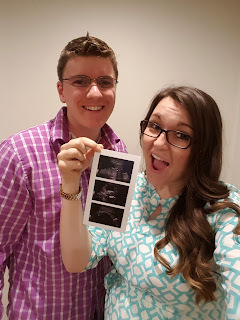 Our first ultrasound at 20 weeks - it's a boy! And it was so cool to see all of the organs and spine on our little baby boy. "Bumping" around on the beach, I was so excited when my cute baby bump decided to appear on our trip to the Philippines/China - ask all of my family, friends and colleagues, I wanted so badly to look pregnant for so long and it finally happened! Eating hot wings every night for 3 days because it is the only thing that sounded good. Subway sandwiches...I didn't crave them per se but wanted them a few different times (which is never the case when I'm not pregnant). I think it was just because I love love love banana peppers, especially on a subway sandwich. And don't worry, I had them heat up my deli meat 45 seconds to make sure it was safe from listeria. Feeling so nauseous one time, the only thing that could make me feel better was a crisp bean burrito from Taco Time - seriously? That one time I ate a small package of red vines for dinner...that's it. Many missed dinners during first trimester. I have not had a lot of cravings and for the most part, continue to eat a healthy,varied diet but man, when you want something, you want it now. Now at 26 weeks, baby is as big as a head of lettuce, almost 2 pounds or so. I've gained about 15 pounds now. 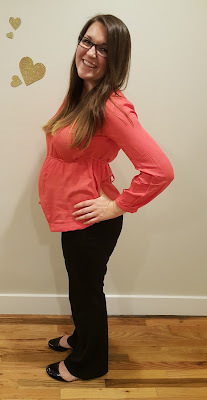 I'm wearing only maternity clothes (starting about 23 weeks). My belly button is still in but feels like it is more stretched by the day. Tummy is getting nice and round. Sleep is slowly getting more challenging and I wake up a couple times during the night to go to the bathroom. The hardest part about sleeping is the pregnancy dreams. These are the worst. I have had the strangest dreams, most of which have nothing to do with my baby but are rather just really creepy. I'll spare you any details. The best moment this week was Bray putting his hands under my belly while I was sleeping and he said he could feel baby's spine and everything as he was kicking around. Baby is moving so much lately and Braden and I both just love it. I'm most looking forward to birthing my baby boy and welcoming him into the world. People think I am crazy when I say this but I'm excited to experience birth and see what my body can do. I attended the most amazing breastfeeding class this weekend with Lactation Link and I feel so much more prepared and excited to bond with my baby boy through breastfeeding. I'm currently reading Bringing Up Bébé and loving it! I may have to share some highlights when I'm finished. 19 weeks! Excited to finally see an itty bitty bump. This is from our gender reveal party. 21 weeks in China - I had so many layers on in this photo because it was so cold! And today at 26 weeks (don't mind my messy bed)...I've definitely popped! I was so excited for birth! To experience this perfect miracle designed by God from start to finish. I knew that fearing the birthing process would get me no where good and would only cause more pain. I knew the baby would get out one way or another and I think all these attitudes helped me to feel way less pain and ultimately I had a drug free birth! You will do great and you get a baby at the end! What could be better!